I was aware of the Nate the Great series when my kids were young, but we never read them at home. 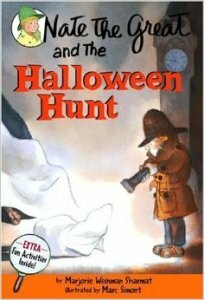 I finally read my first one, Nate the Great and the Halloween Hunt. It’s very much a beginning reader book—no chapters, large type, lots of pictures—just about right for kids who aren’t quite ready for the 10 chapter books. Nate is asked to take the case of a kitten who went missing on Halloween. He does manage to solve the case, but encounters a scary dog and a haunted house along the way. Some early reader books are painful for parents to read with their kids—this one isn’t so bad. I liked the art and the story was engaging and didn’t rely on stupidity to keep it moving. Nate thinks there might be ghosts in the haunted house. That isn’t actually resolved—it’s possible that the house really is haunted. Annie’s dog Fang is actually pretty scary. He doesn’t hurt anyone, but he’s intimidating. Nate’s dog, Sludge, isn’t scary at all. He inadvertently helps Nate solve the case. Nate solves the case with clues that are also available to the reader. His reasoning is spelled out as well. I would guess that a Nate the Great fan soon learns how to solve the mysteries before the solution is revealed, which helps with making a kid into a critical and observant reader. There are plenty of female characters of various racial backgrounds. It’s mostly portrayed through names and art—it’s not part of the story itself. As early reader books go, this one is pretty good. It’s suitable for precocious readers as soon as they’re ready to handle a book of this length—I’m guessing 6 or 7? The book doesn’t seem dated, despite being 25 years old.